This is pretty cool ... Chris Paul was so proud of his pal, Tiger Woods, for winning the Masters on Sunday, he honored his friend with a pair of custom Tiger-themed kicks!! Chris and the Houston Rockets took on the Utah Jazz after Tiger's comeback -- so, Paul decided to make a few alterations to his red CP3.12s to pay homage to the golfer. BTW, Chris and Tiger have been friends for years -- with Chris previously crediting Woods with getting him into golf in the first place. They've been spotted on various courses together several times in the past. As for Paul, he won too -- the Rockets smashed the Jazz 122 to 90. 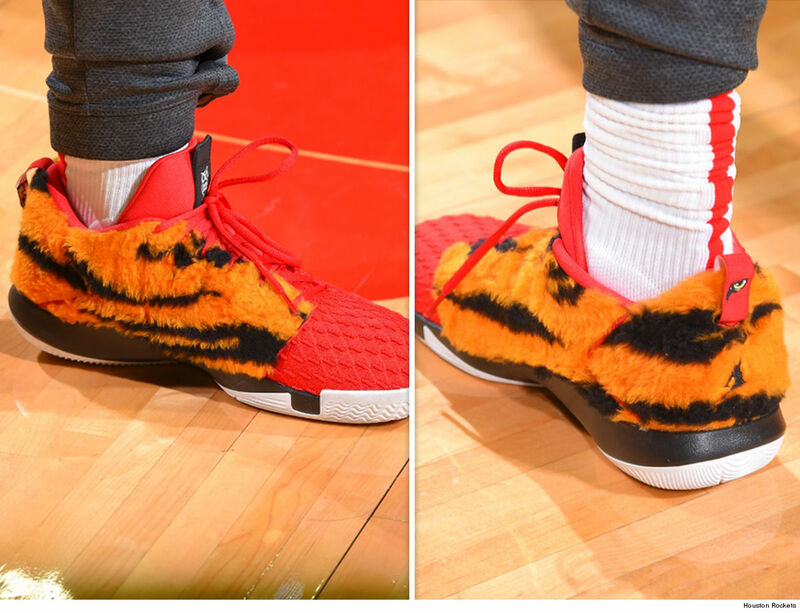 Unclear who actually crafted the custom Tiger shoes. We're looking into it. 8:13 AM PT -- A rep for Nike tells us the shoe was the product of a "partnership between Chris and our performance footwear team" ... and note that it was actually made by Jordan Brand. 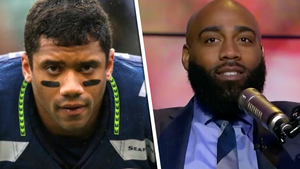 Sorry, James Harden ... you are NOT the MVP of this year's NBA, so says Rip Hamilton -- who tells TMZ Sports, "I might have to go with Giannis." The Association's MVP race is basically down to Harden vs. Giannis Antetokounmpo with only a handful of games left to play ... and Rip tells us he's giving the nod to the Bucks star for now. And, why? The Detroit Pistons legend says he's gotta reward Giannis' win-loss record. "You gotta give credit to Giannis, man. He's on the No. 1 team. He could be All-NBA on defense. So, right now, with Giannis being the best team, I might have to go with Giannis." Antetokounmpo's Bucks are No. 1 in the East with a 59-20 record ... while Harden's Rockets sit at No. 3 in the West at 51-28. But, Harden's numbers KILL Giannis' ... James is averaging almost NINE more points per game AND more assists and steals per contest too. So, is Rip right??? Maybe ... but doesn't seem like there's a wrong answer to us!!! Austin Rivers I Wanna Whoop Dad's Team For Fam Bragging Rights!!! It could get REALLY awkward at the Rivers family dinner table during the holidays ... 'cause Austin and Doc are prepping to face off in the playoffs -- and the NBAer is lookin' to embarrass his dad!! If the NBA postseason started right now, Houston and L.A. would be set up to play in the first round. 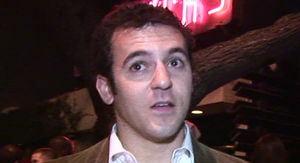 But, that possibility didn't prevent the 2 from breaking bread together at Craig's on Wednesday. 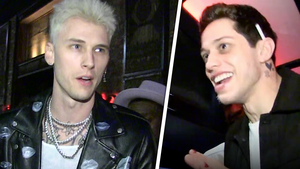 TMZ Sports spoke with the Rivers boys about the possible matchup ... and Doc jokes he hopes Austin will take it easy on the Clips ... but he ain't holding his breath. So, we had to ask Austin if the Rockets would let up on the Clips a little bit, given it's his papa on the other side ... and uh, nope. "Absolutely not. Bragging rights for the household, man. He's done enough in his career ... it's my turn to win something." Of course, things could change between now and the playoffs ... but PLEASE let this happen. Teyana Taylor was right when she said you're gonna love her -- 'cause there's not much else you can do when she shows up to the beach wearing this little get-up. The G.O.O.D. Music singer was out in Miami with her daughter Saturday, where she hit up a beach wearing a sheer leopard print bodysuit without much coverage around back. It's kinda hard to see, but Teyana's got a tattoo of a national flag on her right cheek. Mexico? Italy? 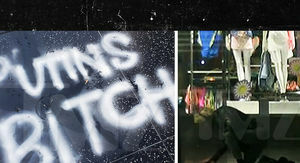 It's not exactly clear ... but we're happy to take our time to figure it out. BTW ... no sign of her husband, Iman Shumpert, here. The Houston Rockets -- who recently acquired him in a trade -- were in town this past week to play the Heat, but it looks like Teyana was out here by herself with their kid for some quality mother-daughter time. Don't worry, Iman ... she represented the family well. Always does. 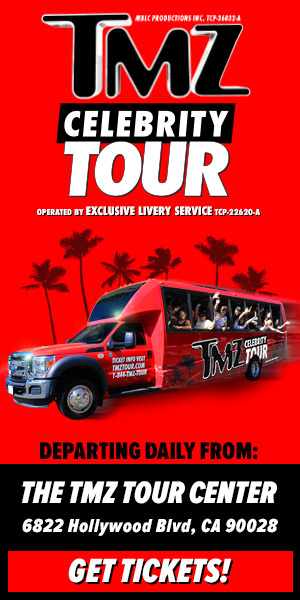 You think LeBron James and the Lakers were gonna let Rihanna down on the night of her birthday celebration???! Hell no!! 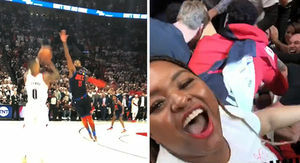 RiRi took her superrich Saudi boyfriend to Staples Center on Thursday to cheer on her favorite NBA player on the night after her 31st birthday ... and the team delivered one heck of a gift!!! 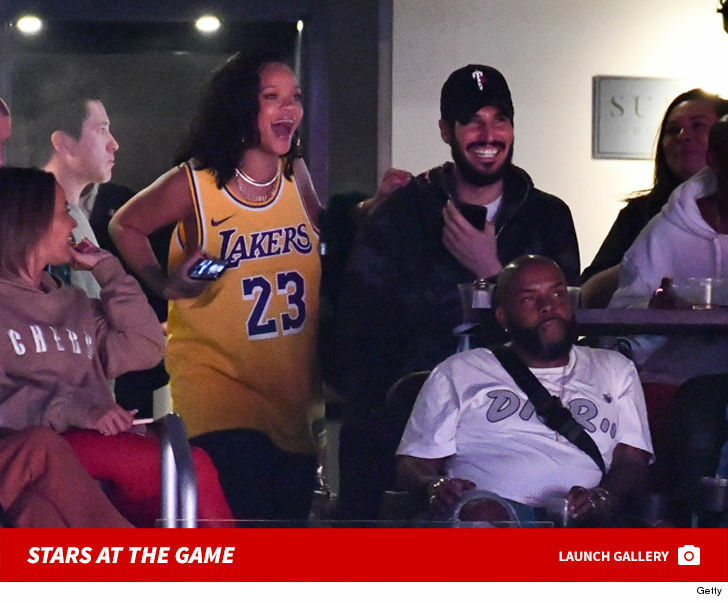 Check out the pics of Rihanna and Hassan Jameel in a private box -- going berserk as the Lakers came back from 19 down to beat the Houston Rockets ... one of the hottest teams in the NBA. Of course, Jameel is a bit of a baller himself -- in 2017 his family was reportedly worth $2.2 BILLION -- which made them the 4th richest family in the Arab world. Jameel started dating Rihanna in 2017 and by the looks of these pics, they're still going strong. 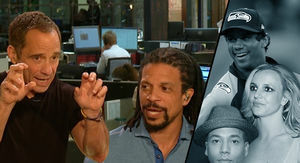 Other huge stars at the game -- "Wheel of Fortune" star Pat Sajak, Denzel Washington, French Montana and Jimmy Iovine. They picked a great game to attend -- the Lakers were getting destroyed for the first 3 quarters before LeBron activated "playoff mode" and went nuclear on everyone ... exploding for 29 points, 11 rebounds and 6 assists. The Lakers ended up winning the game 111 to 106 -- boosting the Lakers' record back to .500. Meanwhile, the Rockets' James Harden extended his 30-point game streak to 32 games, the 2nd longest 30-point streak in NBA history. By the way, Lakers officials gifted Rihanna her very own customized "Bad Girl RiRi" Lakers jersey, but she didn't wear it ... instead, opting to rock her #23 LeBron James threads. One last thing ... every year LeBron has won an NBA title, Rihanna has dropped a new album -- and there are rumors she's working on a new album right now. 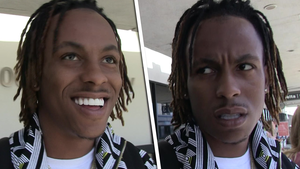 So, good juju for the Lakers? James Harden says he AGREES with Kobe Bryant ... the Rockets will almost certainly NOT win a title with the guard being SO ball dominant. 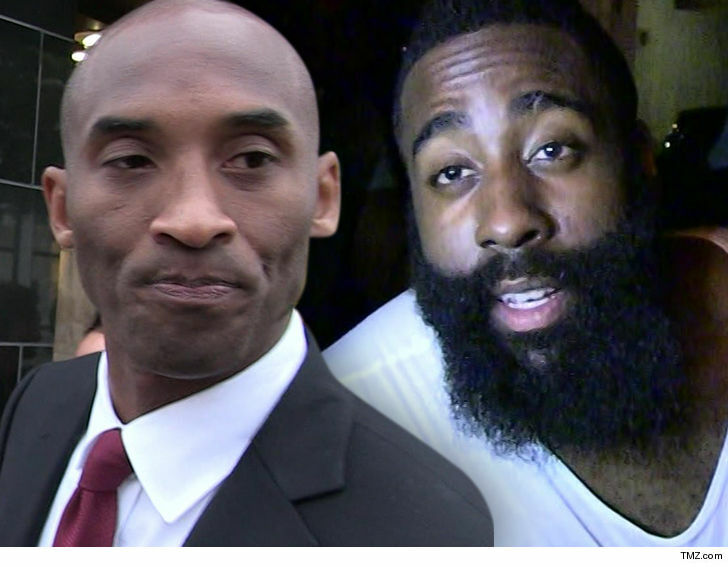 ICYMI ... Kobe served up a warm take about Harden's recent hot streak to ESPN's Rachel Nichols, saying, "I'm not a fan of it in terms of winning championships." For his part, Kobe seems to understand all that ... telling Nichols he expects things to change as well once Chris Paul really gets back in Houston's mix. Seems Ben Simmons is getting more serious about Kendall Jenner -- because he sat his girlfriend with his MOTHER at the 76ers game on Monday! 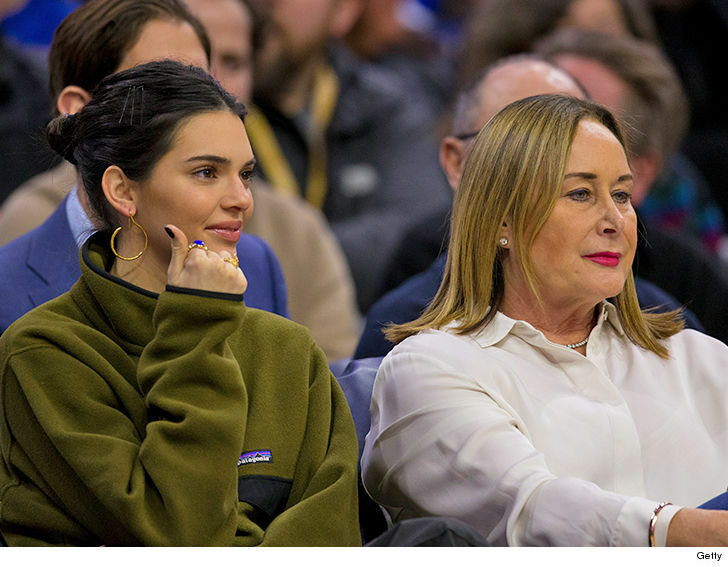 Check out Kendall rubbing elbows with Julie Simmons at the Wells Fargo Center in Philadelphia -- where Ben and the 76ers beat up on the Houston Rockets in a 121 to 93 victory. Ben's stat line wasn't spectacular -- only 9 points, 6 assists and 6 rebounds. 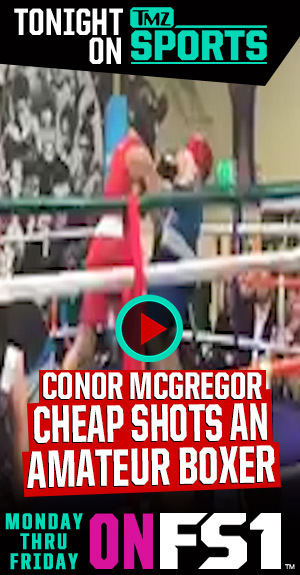 And, he only hit 3 of 12 shots, which is bad for him (he usually shoots well over 50%). But, who cares about individual stats when your team wins, right? Plus, the most important question ... did Kendall and Mom get along?! Pretty well actually. 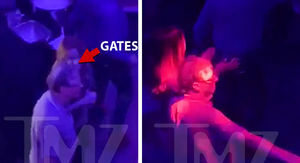 The two were seen smiling and chatting. Good times. It's not the first time they've kicked it together -- Kendall and Julie hung out at a game back in November 2018 and got along great then too. 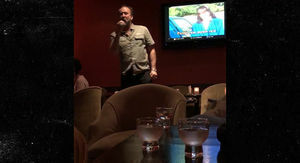 Ben and Kendall have been dating on and off since May 2018. The next big question ... when does Julie get to come to L.A. to meet the rest of the Kardashians?? Kendall Jenner Posts Sappy Love Letter ... From Ben Simmons?! Ice Cube is looking forward to the day Carmelo Anthony suits up for the BIG3 league, but says that shouldn't be for a long time, because he thinks 'Melo can still get it done in the NBA. The BIG3 has become the go-to spot for ex-league guys to flex their skills, with dudes like Al Harrington, Stephen Jackson, and soon to be Lamar Odom all competing at a high level. Anthony's not doing anything right now, so when we got league boss Ice Cube at LAX we asked if he's clamoring to have 'Melo join up ... not so much. "Of course, we'd accept him. 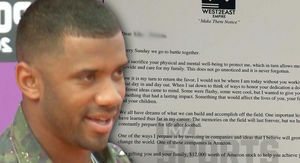 But, he still could play in the NBA, he should be in the NBA." Don't get Cube wrong, he'd LOVE Anthony in the BIG3, but he thinks the former scoring champ still "got some NBA in him." Dope that Cube is supporting Anthony, but we have a question ... if Kevin Durant and Steph Curry wanted to leave the Warriors and join the BIG3, would he discourage them too? James Harden Happy Holidays, Kids ... Buy Whatever You Want!!! He's already got the right beard, and on Christmas Eve ... James Harden went full Santa Claus and provided presents for families who could use an assist. 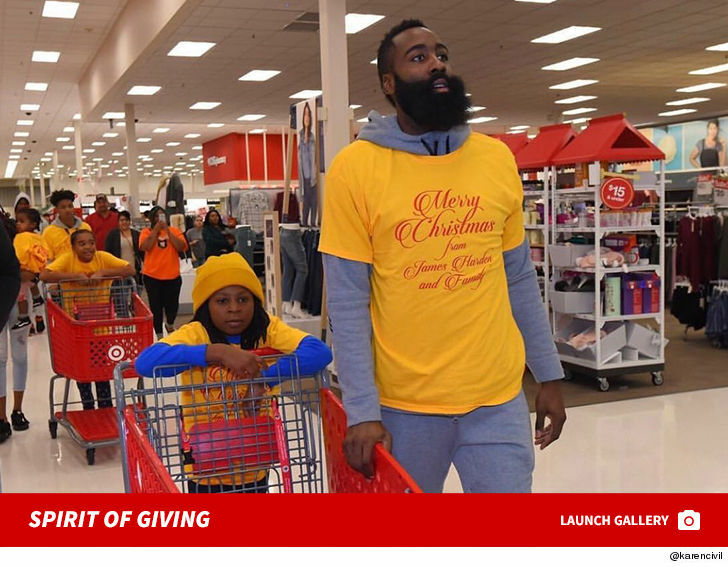 The NBA superstar partnered with Target and Karen Civil on Monday, letting 70 kids run wild in a Pearland, Texas store with loaded up gift cards for a personal shopping spree! We're told each card had a couple hundred bucks on it, and the best part ... the kids had no idea they were in for this treat. 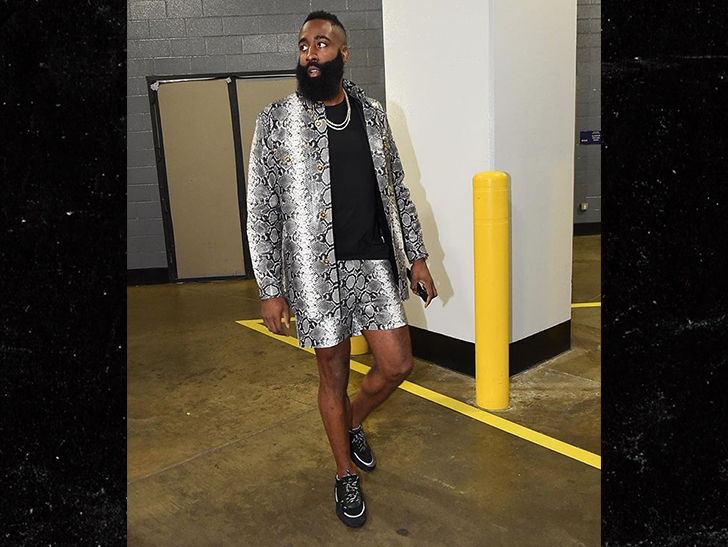 The Christmas karma must have been good for Harden too ... because, on Christmas Day, he dropped 41 points on Oklahoma City to lead his Rockets to a W.
James Harden was channeling his inner Migos before takin' on LeBron and the Lakers ... showing up to the game Thursday in a full Versace snakeskin short suit -- and then he BALLED OUT!! With the majority of his thighs out on display, Harden swagged his way into the Toyota Center in Houston and then dropped a 50 BURGER on the Lake Show. The Rockets eventually won the game 126 to 111. So, how much does drip like this cost? Versace tells us the faux python outfit isn't even available to the public until the start of 2019 -- the top will set ya back $7,595 ... and the pants are $3,495!!! Harden's also in the middle of a $228 MILLION contract extension, so money is no object when it comes to fashion. 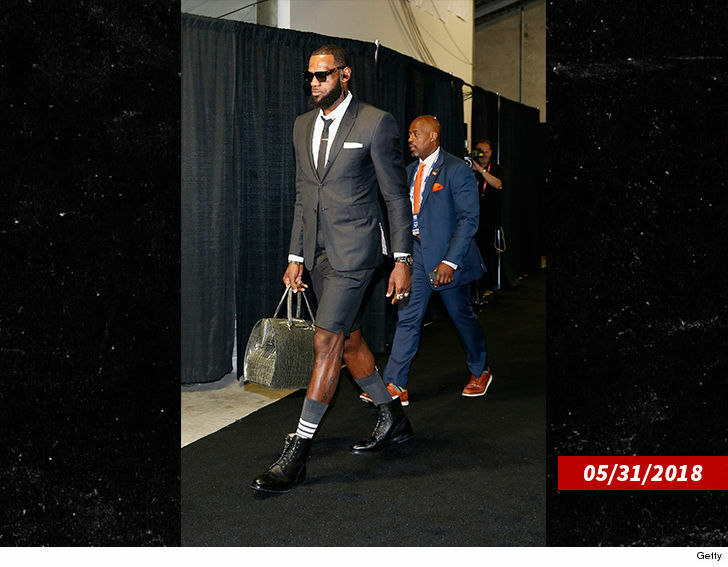 Seems the fit could be a tribute to Bron's trend-setting look from the NBA Finals last season ... when the King rocked a short suit before Game 1. We gotta say, Harden's got the upper hand on LBJ with this one. Tracy McGrady has some Hall of Famer to future Hall of Famer advice for Carmelo Anthony ... move on, bro ... saying he believes it's time for Melo to put a period on his NBA career. Anthony is reportedly on the outs in Houston and McGrady says he's being unfairly scapegoated for the Rockets' slow start. Problem is, Tracy thinks that's gonna be the case wherever Anthony goes. "If he goes to another team and his team starts playing bad, then what? They're gonna blame Melo." But, don't get it twisted -- T-Mac says Melo can DEFINITELY still ball at the top level ... he just thinks the NBA has turned the page on Anthony, not giving him a fair shake, meaning he only has one option. "He should retire. Enjoy life man, enjoy his son." 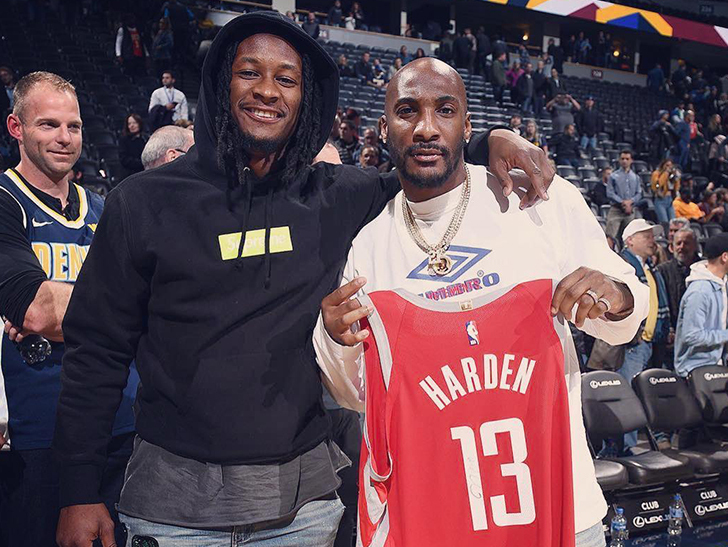 Aqib Talib didn't just have the best seats in the house for Tuesday night's Rockets-Nuggets game ... dude got the dopest souvenir ever too -- James Harden's game-used jersey!!! The L.A. Rams -- in town 'cause they wanted to practice at altitude to prep for their now-moved Mexico City game (more on that later) -- popped by the Pepsi Center to catch some hoops. Dudes like Talib, Todd Gurley, Jared Goff and Marcus Peters were all courtside ... but for some reason -- Harden decided Talib was most worthy of the post-game swag. The Bearded One even signed it ... and Talib loved it, saying, "That courtside drip, you feel me?! That's authentic. It's still sweaty. That thing still sweaty, straight off the court!" L.A. was set to face the Chiefs next Monday night in Estadio Azteca, and was trying to hit up Colorado Springs all week to prep for the altitude in Mexico's capital. But, since recent Mexico City concerts tore up the field ... the game got moved back to L.A. -- which appears to mean the Rams will head home soon. 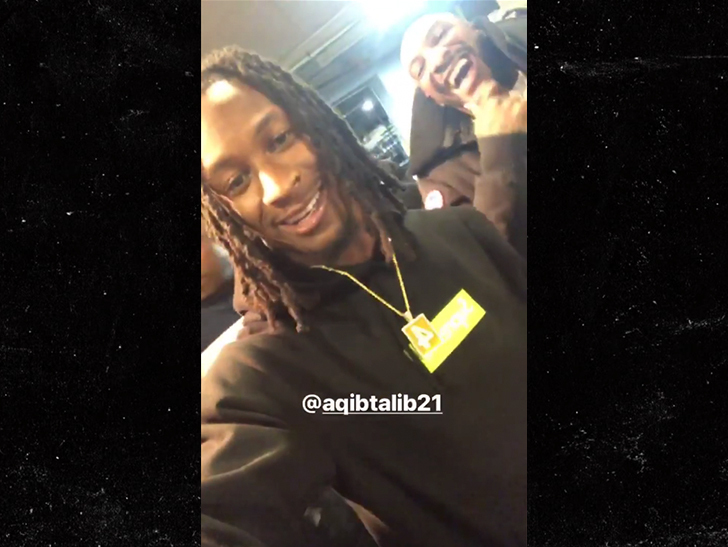 Don't feel too bad for at least one of the Rams superstars for leaving the game empty-handed -- Gurley was still rockin' the sick diamond pendant YG gifted to him this week!! Carmelo Anthony ain't gonna have an easy time finding a new squad after the Rockets boot him to the curb ... so says Byron Scott. Don't get the ex-NBA coach wrong ... he likes Melo and thinks he can still shoot it -- but, he tells TMZ Sports﻿, the market for the 10-time All-Star after he moves on from Houston will be wafer-thin. "It's gonna be hard, man," Scott says. Byron's biggest issues with Melo? He says the dude can't fit in with teams looking to rebuild with younger players -- and he can't fit in with squads that get up and down the floor. So, Scott says the only possible landing spots for the future Hall of Famer are with veteran, half-court teams ... or nowhere else. 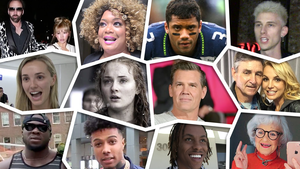 BTW ... we also asked Scott about the Lakers and the job Luke Walton is doin' -- and he says everyone just needs to be patient when it comes to LeBron's first year in Hollywood. But ... we had to ask -- would he consider linking up with his ex-Lakers teammate, Magic Johnson, and coaching L.A. if Walton falters?? Ya gotta hear his answer.